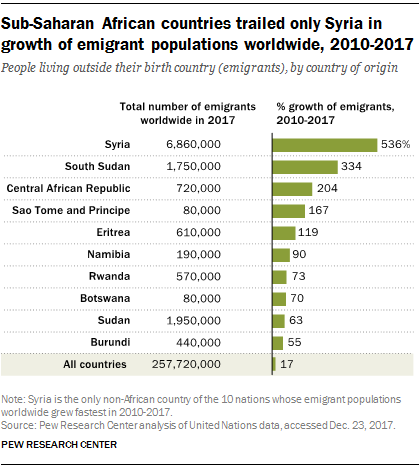 Sub-Saharan African nations account for eight of the 10 fastest growing international migrant populations since 2010, according to a Pew Research Center analysis of the latest United Nations data on the number of emigrants, or people living outside their country of birth. The number of emigrants from each of these sub-Saharan countries grew by 50% or more between 2010 and 2017, significantly more than the 17% worldwide average increase for the same period. At the country level, only Syria had a higher rate of growth in its number of people living in other countries. Explore our updated interactive map based on United Nations Population Division data. The total number of emigrants worldwide from all sub-Saharan African countries combined grew by 31% between 2010 and 2017, outpacing the rate of increase from both the Asia-Pacific (15%) and Latin America-Caribbean (9%) regions. Only the Middle East-North Africa region saw a larger increase (39%) of people living outside of their birth country during the same span, driven largely by people fleeing conflict in Syria. The number of international migrants from sub-Saharan Africa between 2010 and 2017 has grown at a higher rate (31%) than in the 2000s (25%) and the 1990s (1%). And as international migration has increased, the breakdown of where sub-Saharan emigrants live has changed. In 1990, 75% of emigrants from the region lived in other sub-Saharan countries, a share that dropped to 68% by 2017. Over the same period, the share of sub-Saharan emigrants who live in the United States climbed from 2% to 6%. This has helped make African immigrants a small but fast-growing slice of the overall U.S. immigrant population. As of 2017, nearly 1.5 million sub-Saharan immigrants lived in the U.S., according to UN data. More substantially, the share of sub-Saharan migrants living in European Union countries, Norway and Switzerland rose from 11% in 1990 to 17% in 2017. Whether their destination is a neighboring country, Europe or the U.S., many sub-Saharan emigrants face obstacles to relocating. For example, reports indicate hundreds of thousands of emigrants from south of the Sahara Desert have gathered in Libya in hopes of crossing the Mediterranean into Europe. Many live in overcrowded, crime-ridden camps while they wait to make the journey, with some allegedly even being sold in slave auctions. Sub-Saharan emigrants are only part of Africa’s international migration story. North African nations have also experienced decades of significant outmigration to Europe and other parts of the world. In 2017, about 5.2 million North African immigrants lived in EU countries, Norway and Switzerland, compared with about 3 million in 1990. Despite the large increase, the North Africa-to-Europe migration corridor is dwarfed by the world’s largest corridor – Mexico to the U.S. Some 12 million Mexican immigrants live in the U.S. as of 2017. Looking ahead, the number of international migrants from Africa as a whole is expected to increase in coming decades, due in part to the continent’s growing population. How receiving nations will respond remains to be seen. Currently, Europe is sending money for development to assist African countries. Meanwhile, the U.S. government has reduced the number of refugees it resettles and proposed cutting back on other legal pathways to the U.S. 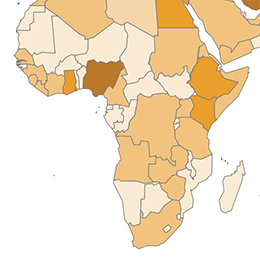 This is the first in a series of posts, reports and data visualizations from Pew Research Center focused on migration from Africa to the U.S. and Europe.